Andrea Roggi was born on July 2nd 1962 in Castiglion Fiorentino, Tuscany. In his teenage years the artist began to cultivate some of his many interests, including painting and poetry, until he gradually focused on sculpture. He attended for a short period of time the studio of Enzo Scatragli — a fellow artist and himself a native son of Castiglion Fiorentino — to expand his knowledge of sculptural techniques. The event that marked a true artistic turning point in his life came when he visited the Basilica of Santa Maria Novella in Florence, where he was literally spellbound by the strong plastic effect of The Trinity, a fresco by Renaissance painter and countryman Masaccio. 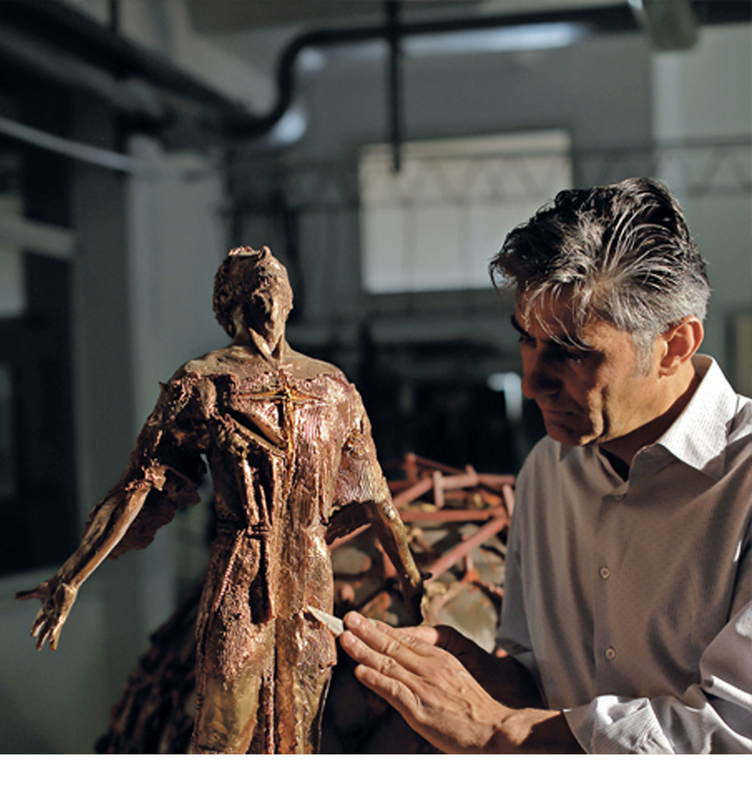 In 1991 he set up the art workshop La Scultura di Andrea Roggi, where he has been crafting his sculptures from start to finish and, with the help of his assistants, he manages to create large-sized yet finely detailed pieces. Bronze is the material he chose, which he puts through the lost-wax casting process to finally transform the clay models into masterpieces. In 2017, fascinated by the imposing quarries that surround the town of Pietrasanta, the artist began to dedicate himself to the creation of artworks in marble. In the late 90s he became the initiator of the Art for Young movement, aimed at awakening an appreciation of art and all art forms in young people. The movement has culminated with the inauguration of the Parco della Creatività, its crowning achievement. Since 2000, Roggi has been pursuing a fruitful collaboration with the University of Georgia, based in Cortona, and with the University of Texas, based in Castiglion Fiorentino, where he holds workshops and courses on sculptural techniques. In the early 2000s, he became fascinated with one of the most prominent intellectual figures in Tuscany, Pier Francesco Greci, especially with his theories about the art of Piero della Francesca. Roggi has produced a number of public artworks located in Italy — mostly in Tuscany and Umbria — and abroad. His works are featured in many art collections around the world and he has participated in various national and international exhibitions held at major venues such as the Olympia Grand Hall in London, the Ahoy in Rotterdam, the Grand Palais in Paris, the Grimaldi Forum in Monaco, the Fukuoka Oishi Gallery and Fukuoka City Museum in Japan.